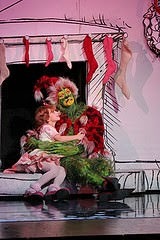 Stapleton Moms: How the Grinch Stole Christmas - LIVE! How the Grinch Stole Christmas - LIVE! There is nothing more Christmasy to me than going to a performance at the Denver Center for the Performing Arts downtown. As a kid growing up in Longmont, some of my fondest memories are getting all dressed up to see the afternoon matinee of The Nutcracker with Grandma, Mom, Aunts and cousins. A few years ago, I took my son to The Nutcracker. It was OK, but didn't have the magic for a little boy the same way it does for little girls. 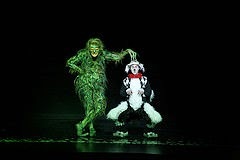 So when we heard the musical of "How the Grinch Stole Christmas" was coming December 17-28, I knew it would be the right one to take my son to. And it did not disappoint. Yes, everyone knows the story of the Grinch. The nearly perfect cartoon is hard to beat, and you don't want to mess with perfection - so the musical doesn't. They embrace the Grinch that we love - the hairy, drumming fingers, the petulant Grinchy scowl, and that bass voice. There is even a chance for the audience the chance to belt out "You're a mean one, Mr. Grinch. A nasty wasty skunk..."
And yet they came up with a sweet way to tell the story from the viewpoint of Max, the dog. It was absolutely delightful. The moment when it began snowing - real, wet snow - in the Buell Theater was pretty magical - the stuff memories are made of. There are matinees this weekend (Dec. 21-22) and next (Dec. 27-28) and even a 7:30 performance on Christmas Day - but hurry, tickets are selling fast! Or take a break from Christmas shopping for Story Time with the Grinch - December 19 & 23 at 11:30am in Cherry Creek North! Join the Grinch for story time as he reads How the Grinch Stole Christmas at the DCPA Holiday Box Office from 11:30am- 12:30pm on December 19 & 23. The Holiday Box Office is located at 2771 E. 1st Ave., Cherry Creek North (next to Bose, across from the mall). Story Time is free and open to the public.